unfortunately, I'm no computer guy but is there anyway to put the Texas Tech bell ringer in front of JJ, if you know what I mean? Might not be the bell ringer, but will this do? This needs to be nominated to the Hall of Fame!!! Probably at the tailgate or rereading the Twizzler thread. What is the Twizzler thread? My bad. I've just heard about it and never seen it. Check the HOF thread about Eddie Sutton and Andre Williams. Over 8600 post. I applaud this thread making it to the HOF. Not as happy as I am. I had one more gem to contribute before the thread died a natural death. Now is my time. I always wondered what the hell that was. Now I know. I always wondered what that was. God bless this thread. God bless it real good. Despite his alumni being denied an invite, JJ still hopes for his own personal welcoming into the southeastern conference. Can we move this into the main forum for this week? Seems fitting. Love it! Still awesome one year later. This beats the pants off any Stunned Okie thread by a long shot. Oh this is funny. 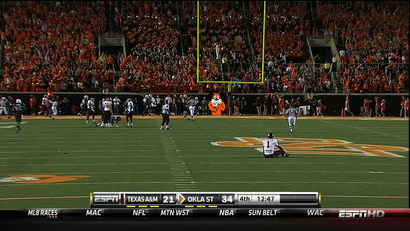 Well done Pokes, well done.